The embargo for Yooka-Laylee will be over at 9 AM BST tomorrow, April 4th. I will consolidate reviews as they are released in this thread so we can all tear them apart for not being sufficiently fawning in their commentary or for not mentioning the horror of the Jontron removal. "Banjo Threeie is probably never going to happen, but after playing Yooka-Laylee I'm fine with that for the first time in 17 years. Playtonic's first foray is rough around the edges, but the center is so full of heart that it'll melt away the more you play it. How much of that roughness you can put up with entirely depends on your history and mental fortitude for mascot platformers. For some of you that threshold is pretty low, but for me, it's as high as Laylee can fly." "Yooka-Laylee looks the part of an updated platformer, but some of its mechanics should have stayed back in the era it came from. There was a reason we haven’t seen more games like Banjo-Kazooie on modern platforms, and it wasn’t just because Rare as we knew it was gone; its ideas were very specific to a gameplay era that we’ve evolved past. Fourth-wall-breaking dialogue, shiny characters and lush graphics can’t save Yooka-Laylee from the dated framework that it’s built on." "Yooka-Laylee might have been born out of nostalgia for a period in gaming that, yes, is a tad overrated. But Playtonic's take on the early 3D games of the '90s is more progressive than your average piece of pixel-art gumpf, even if it misses the mark in places." "I’m far less sure of how someone without that attachment to the originals will perceive the mix of flaws and strengths. For me the chance to revisit one of my first game infatuations did reduce the annoyances, or at least they became part and parcel of going back – you take the irritants with the joys because without it it wouldn’t be the same. But I want to end by highlighting that this is a friendly game regardless of whether you had an N64 two decades ago. That feels like a valuable commodity at this point in time. Yooka-Laylee is bright, it’s positive, it’s daft and it wants to play with you. And that’s lovely." 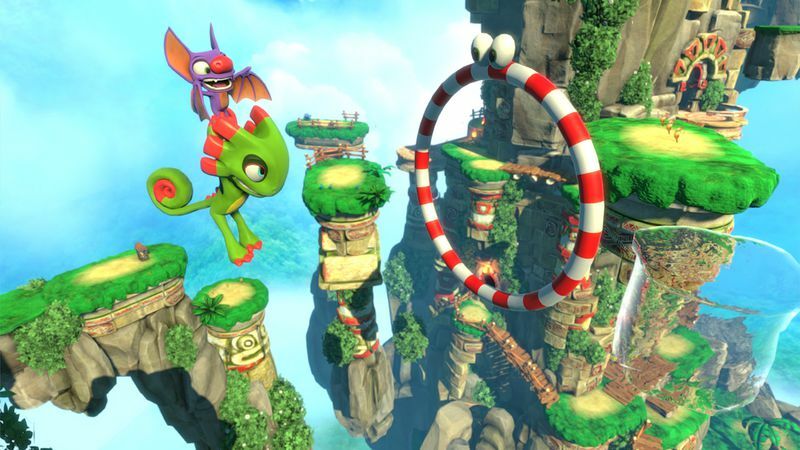 "Ultimately, Yooka-Laylee’s best and worst aspects come directly from its predecessor. Despite attempts at modernizing the formula, its style of gameplay is still outdated, and it doesn’t stay challenging or interesting for long as a result. But if you’re looking for a faithful return to the Banjo-Kazooie formula, Yooka-Laylee certainly delivers--from the font to the music to the wealth of collectibles, it’s worthy of the title of spiritual successor." "Though camera problems and outdated level design are present at times, the moments of exhilaration, discovery, and satisfaction far outweigh those pitfalls. It feels like ages since I've played something like Yooka-Laylee. This is a game that was built for those who look back with fondness on the classics that spawned it, and in that regard, it delivers completely." I'm expecting above average review for better or for worse. There used to be something here but I blew it up! Drinking game: Take a shot everytime JonTron is mentioned. Chug if they mention Banjo-Kazooie. Honestly though, I'm hyped for this game. Reviews are up - fair to say it's mixed, although it does seem like many of the complaints are just inherent to the genre, so I'm not really all that worried. Was a bit concerned at first, but yeah, this is my thought as well. At a glance, it seems the main problem is just that it doesn't modernize enough from the original N64 games, but I still find Banjo-Kazooie a good game, so hopefully this won't be a problem. Still a shame it's not scoring so hot, though. Same. It isn't scoring so hot, but it seems like that's partially because platformers are a niche genre these days, and some reviewers just kinda don't understand it. I'm perfectly certain we're looking at a great game here that some people don't understand the appeal of. I have heard about legitimate issues though, namely that the camera is BAD, and that on Xbox One at least it's plagued by stutters and frame drops. It's probably not perfect but I'm pretty sure it'll get a 9/10 from me. A- Alex isn't an extraordinarily common name, is it? I'm still completely ed up over Jim Sterling's 2/10. He has to just be bad at it. I stream whenever I can. Follow my Twitch. Last edited by Adam; 21st April 2017 at 03:32 AM.